Calling all boys in the Ballinderry Area. Do you like fun and games? Do you like meeting new friends? Do you want to try new activities and challenges? If so, come along on Friday evenings to Ballinderry Parish Church and join the Church Lads’ Brigade. Find out how God wants you to live your life. Starts Friday 15th September 2018. You will be made to feel welcome by a dedicated team of leaders, committed to guiding and looking after you. These leaders have all gone through the ranks of CLB and love CLB so much that they are still in it!!! What are you waiting for? Be there or you will never know what you are missing! 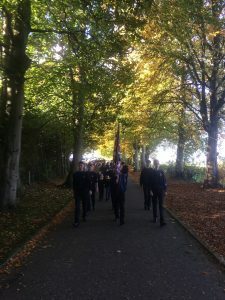 The Church Lads’ and Church Girls’ Brigade (CLCGB), often referred to as ‘The Brigade’, is The Anglican Churches own uniformed youth organisation: welcoming children and young people of all faiths and none. This organisation has a lot of history and, for over 120 years, The Brigade has been fulfilling its object to extend the kingdom of Christ among lads and girls.